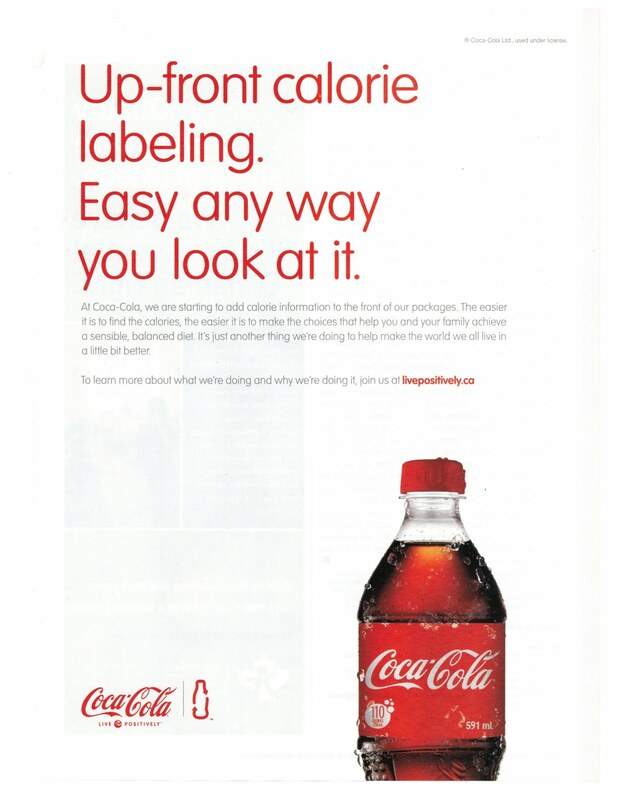 Weighty Matters: Coca Cola's latest deceit revisited. I last blogged about this ad in April. I called it, a case study on deceitful marketing that I cut out of my local newspaper. "Up-front calorie labeling. Easy any way you look at it"
"the easier it is to find the calories, the easier it is to make the choices that help you and your family achieve a sensible, balanced diet"
Now putting aside the fact that Coca Cola has no place in a sensible balanced diet let's go back to how easy it is to find the calories. Looking at this helpful new label it would appear that the bottle of Coca Cola has 110 calories. No need to read between the lines. What it doesn't mention is that while there might not be a need to read between the lines, there's a need to read below the lines and then follow that up with some long division and multiplication. If you look just below the large fonted 110 you might notice the small fonted calories/250ml qualifier. 591mL/250mL * 110 calories = 260 calories. 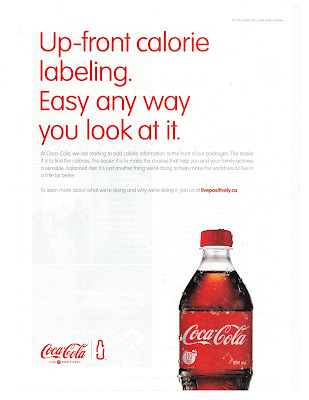 Coca Cola folks, when you read this - 260 calories in big type on your 591mL bottle would be up-front labeling. especially given that's how you label it in stores. 110 calories in big type on a 591mL bottle with small print below stating /250mL? That's still just slimy marketing. 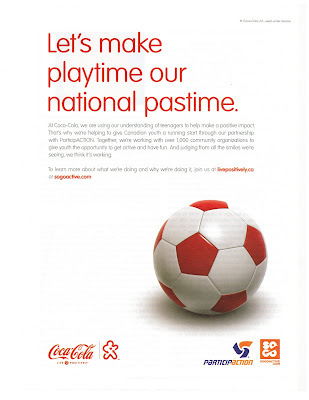 And while that sounds lovely I can't help but imagine that Coca-Cola's true goal is that by making us feel like Coca-Cola is part of the solution that somehow we minimize the fact that drinking sugar water contributes to weight gain, and that inactivity, not the consumption of their empty calories, is what's responsible for childhood obesity. After all, it's all about "balanced, active lifestyles", isn't it?